Chennai, Mar 06: The fans of Suriya and Thalapathy Vijay are gushing after the former's selfie with the latter's parents doing the rounds on social media. 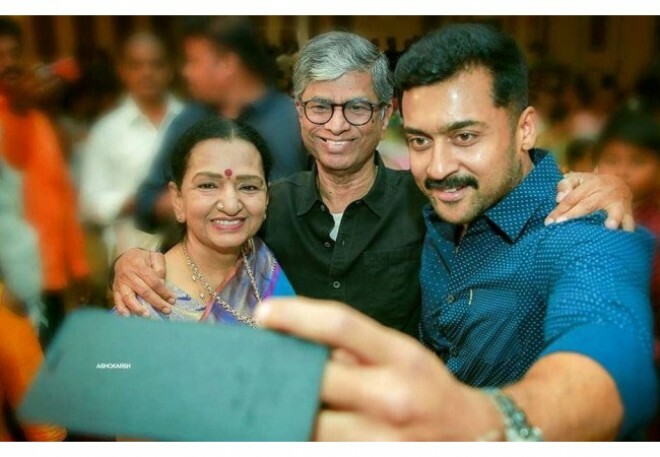 In this regard, The viral picture shows Suriya's selfie moment with Vijay's parents SA Chandrasekar and Shobha at a wedding is viral. The wedding was of Vijay's personal assistant Rajendran's daughter where Suriya came face-to-face with Vijay's parents. Well, the picture shows the warmth and camaraderie stars share at a time when respective stars fans indulge in the war of verbose on social media. Recently, Rajinikanth's picture with Shobha Chandarasekar also did rounds on social media leaving netizens in awe and gushing.